At Lashbrook Fields we choose to farm heritage breeds that are native to Devon. These breeds are less commercially attractive because they mature at a much slower, natural pace. However, this produces a much higher quality of meat and allows us to employ farming practices that are sympathetic to the animals and to the environment. Our main herd consists of Devon ‘Ruby Reds’, or ‘Devon Red’ cattle, including ‘Bully’ (he’s actually a big softy) the inventively named bull. However, we also farm a mix of other animals to ensure land is not overworked by a single use. This includes ducks, chickens, sheep and our resident pig ‘Doris’. 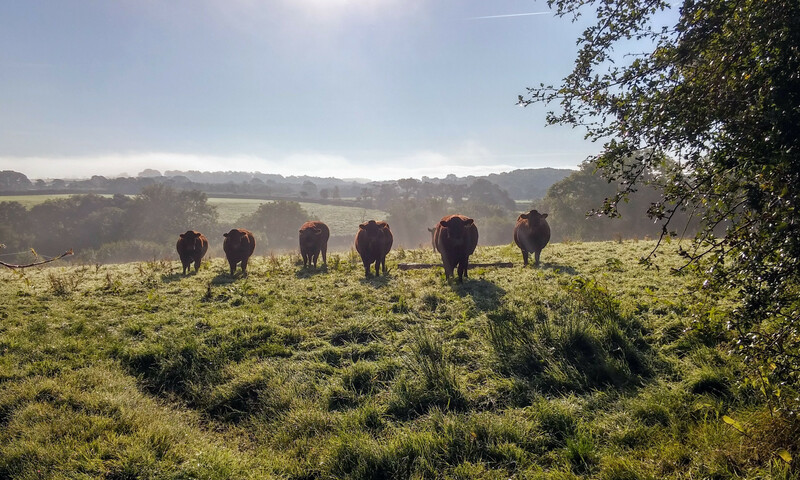 We are a small, family-run, farm specialising in rearing heritage breeds that are traditionally native to Devon. We chose our heritage breeds because they grow and mature at a natural pace, as opposed to more modern commercial breeds. Not only does this produce much better quality meat, it also allows us to farm in a way that is sympathetic to the animals and to the environment. We are well on the way to constructing our beautiful new holiday letting: a two double bed converted barn. Hopefully in the near future we’ll be able to invite you to come and stay with us and experience the tranquil north Devon countryside.